Google’s authorship programme has clear benefits as it highlights content to people searching for content on Google. It encourages brand uplift and is likely to increase CTR in SERPs (search engine result pages) resulting in increased traffic and improved SEO signals. For the full list of benefits, see Copyblogger’s excellent post: 10 reasons writers should claim their authorship markup. 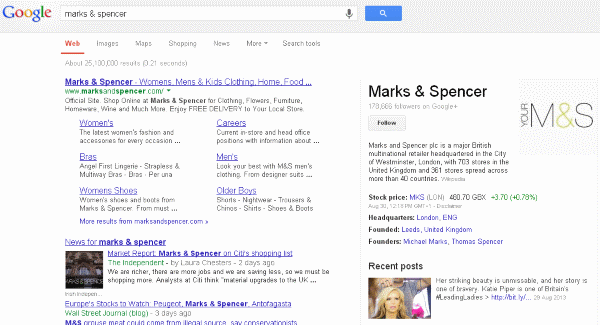 Below is an example of a standard author snippet in Google.co.uk. In addition to the headline linking to the target landing page, clicking on the author name or circle count will take you to that author’s Google+ profile page. Google.com has an additional feature where clicking on the author’s name reveals their Google+ profile and recent content to the right of the SERP. In order to sign up to the programme, it requires content authors to either link their content to their Google+ profile or sign up to Google’s authorship programme. Sounds simple enough!? If you’re still confused, I’ve listed 8 of the most frequently asked questions. Google is more likely to publish authorship markup when a page contains a single article or piece of content written by one author. You should then publish a byline on that page highlighting the author’s name as it appears on their Google+ profile. If you publish a list of blog posts, for example, authored by multiple people, this wont be applicable. Moving beyond web pages, Google is experimenting with authorship from other file types such as Powerpoint and other MS Office files. 2. I don’t have a blog but instead rely on product pages. Can these apply? The idea behind authorship is that it demonstrates an author’s view of a topic or news story. As product pages (or similar types of pages) are less analysis orientated, they currently won’t apply. Of course an opinion piece about a product, written by a single author, can apply. 3. I don’t have individual authors for content pages – can I use a company logo or mascot instead? This is a fairly common issue as many companies won’t have multiple authors and would prefer to publish content under their brand name or a ‘mascot’. When it comes to authorship, Google prefers to see content written by a single author as it can then apply authorship annotation giving the content credibility. As mentioned earlier, content need to feature an author byline linking to that person’s Google+ profile rather than linking the byline to a company’s Google+ page. 4. What happens with multilingual/translated content authored by the same person? If an author’s content appears at two URLs e.g. domain.com/en/blog-post.html and domain.com/de/blog-post.html both of those pages can link that author’s Google+ profile page in the author’s chosen language. There is no need to link to two separate author profiles on Google+ written in different languages. 5. Can I have more than one author/contributor per page? As discussed in question 1, Google currently only supports one author per page. 6. What’s the difference between rel=author and rel=publisher? To put it simply, rel=author helps individuals associate a specific page/URL to their Google+ profile. Whereas rel=publisher helps businesses or organisations associate their website with their Google+ page, enabling Google to publish their Google+ profile details directly into search results (see below). Although rel=publisher and rel=author are both link relationships, they are actually independent of one another. 7. Why isn’t my content appearing as an author snippet? There could be a number of reasons why your content isn’t being displayed as an author snippet. 1. 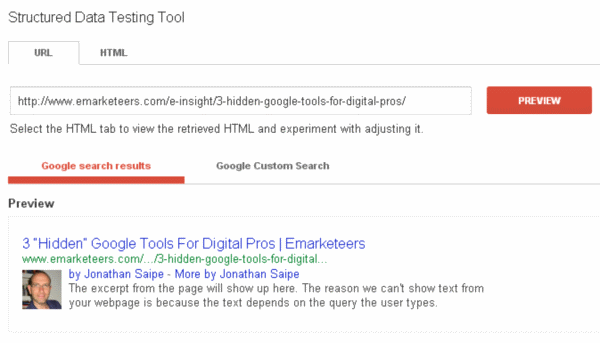 Firstly check to see you’ve added the correct markup using Google’s rich snippet testing tool. This will show you any issues as well as how your content will be displayed in search engines. 2. Make sure the author byline published on your page matches your Google+ profile (for example “By Jonathan Saipe”) with your name linking to your Google+ profile page with rel=author in the <ahref> HTML code (see question 8 below). 3. Make sure you have a Google+ profile photo with a recognisable head shot. 4. Ensure that you are the only author of that page and that there aren’t multiple authors (check for multiple bylines in the page content). 8. I’ve signed up to Google’s authorship programme but I write on many different domains/websites? If you contribute to one domain and that domain matches your email address, then the easiest thing is to sign up to Google’s authorship programme. Still confused? Check out Search Engine Land’s excellent post: the definitive guide to Google authorship markup. If I have many businesses with different domains, so can i still use single google’s authorship badge for all my businesses? Google has a bit of crazy going on here. An author can be a contributor to multiple sites but a business has to set up a separate G+ for every single domain and subdomain. It’s nuts and people have been frustrated by it since late 2012.